WIDETRAK: THE FAMILY THAT WORKS TOGETHER. When there's a job to do, there's no better choice than a Polaris Widetrak. Purpose-built to tow, haul and get you where the work needs to get done. 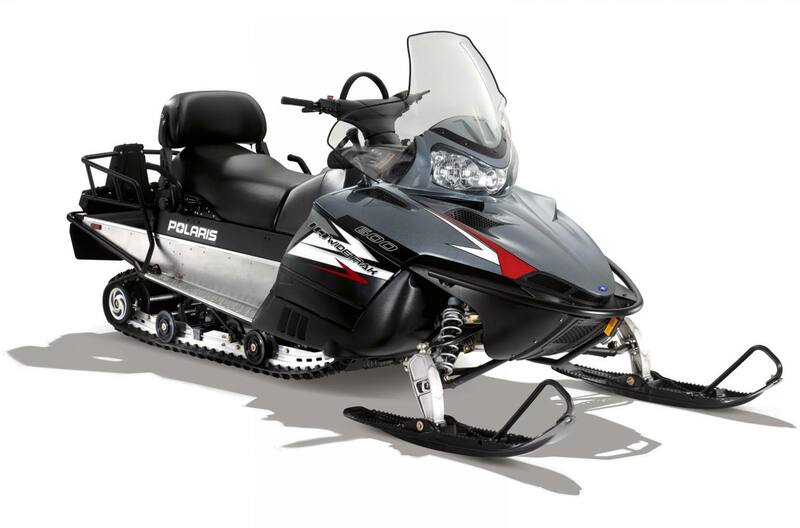 Fullfeatured sleds with Hi-Low transmissions, cargo racks, reverse and of course,like the name says, an extra wide track — 20"" of flotation to be exact. Adjustable Backrest: Affords convenient, comfortable support when you're out working hard. Easily converts from two-up to solo riding along with the removable passenger handholds. Cargo Rack & Worklight: Durable, steel construction and enough room to carry your ice auger or chainsaw. Whether your workin' or playing, you'll appreciate the 13 watt worklight when you need it or to watch the load you're towing. Track Width/Length/Height: 20 x 156 x 1.25 in. 20 x 156 x 1.25 in.